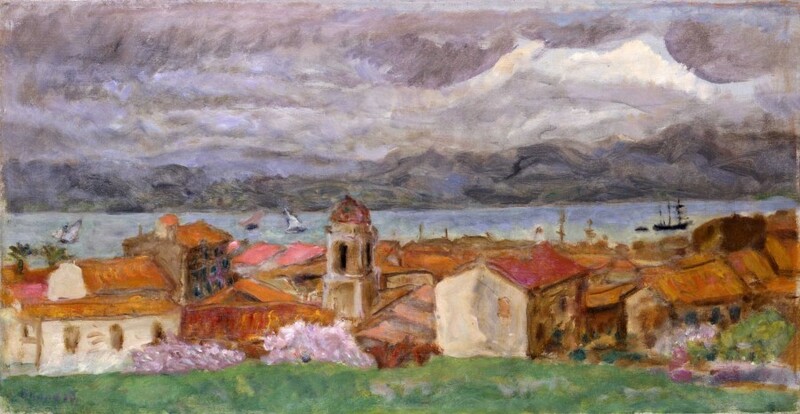 In the winter of 1914, Bonnard rented, for two months, the Villa Josephine in St Tropez. This is the only distanced view of Saint-Tropez from this period, recorded in the Dauberville Catalogue Raisonne. The grey turbulence of sea and sky reflect a mood of war. Yet Bonnard seems also to be escaping through the delicate, vibrant, layered harmonies of contrasting colour. Jean and Henry Dauberville, Bonnard Catalogue Raisonne de l'Oeuvre Peint, Paris 1992, Vol.11, P.338, No. 805 illustrated.